The heptathlon 100m hurdles is the first track event of the 2016 Outdoor Heps Championships. Defending champion Madison Hansen of Harvard sprinted out to an early overall heptathlon lead by going sub-14 in the hurdles – 13.93, a new personal best for the senior – to get 988 points. Indoor Heps pentathlon champion Taylor Morgan of Princeton and Dartmouth’s Allison Frantz also gained 900+ points in the hurdles, running 14.30 and 14.44, new personal bests for both respectively, to sit second and third overall in the point standings. All of the hurdle times are wind-legal. The next heptathlon event will be the high jump, which should start a little after 11:30am. In the decathlon, Dartmouth’s Nico Robinson edged out Cornell’s Austin Jamerson by 0.01 seconds for the top 100m time – 11.12 to 11.13. Harvard’s Mark Hill was not far back in 11.18, while Princeton’s Bryan Oslin ran 11.25. These four men got 800+ points for their performances – 834, 832, 821, and 806 points respectively. Robinson, Jamerson, and Oslin all set new 100m PRs. The men head over for the long jump for approximately a noon-time start. Noon is also when the women’s hammer, men’s pole vault, and men’s long jump finals are scheduled to start. The men’s pole vault has been moved indoors due to the weather. The men’s hammer final is complete – check out our recap here. The decathlon long jump is now complete. Jamerson and Robinson both had bests over 23 feet. Jamerson jumped 23-04 1/2 for another 842 points, while Robinson jumped 23-01 1/4 for 823 points. Jamerson leads the overall decathlon after 2 events by 17 points over Robinson – 1674 to 1657 points. Hill is only 27 points behind Robinson with 1630 points, while Benjamin Ose of Dartmouth is in fourth with 1600 points. 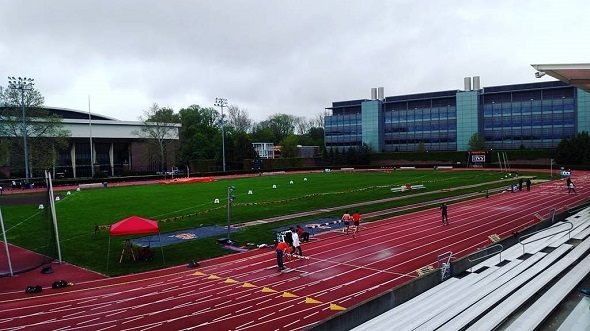 Track preliminary rounds will begin at 1pm with the men’s 1,500m prelims. This entry was posted on Saturday, May 7th, 2016 at 10:21 am. It is filed under Heps Champs, Spotlight. You can follow any responses to this entry through the RSS 2.0 feed.